Lindenwood University’s Theatre Department will present William Shakespeare’s magical comedy A Midsummer Night’s Dream at 7:30 p.m. on Feb. 1-4 and at 2 p.m. on Feb. 5 in the university’s Emerson Black Box Theater. Lindenwood University has received a $280,000 matching grant from the J.E. and L.E. Mabee Foundation. The Mabee grant will be used to help fund a 43,000-square-foot Student-Athlete Center. Lindenwood University’s Institute for the Study of Economics and the Environment will welcome financial expert Rex Sinquefield to deliver the institute’s 2012 Winter Policy Lecture at 3 p.m. Thursday, Feb. 9, in Harmon Hall’s Dunseth Auditorium on the school’s St. Charles campus. Lindenwood University’s Black Student Union will present “The Life and Legacy of Dr. Martin Luther King, Jr.” at 3 p.m. on Monday, Jan. 16, in the Emerson Black Box Theater of the University’s J. Scheidegger Center for the Arts. The event is free and open to the public. Director of Student Life Sports Tim Canavan has announced the hiring of Mark Wilson as head coach for the new Lindenwood University billiards program, which will begin competition during the fall semester. Wilson has been a billiards instructor and coach for over 35 years and as a professional player, has been ranked in the top 25 in the world. Lindenwood University has been named the recipient of a $114,000 joint grant from the William T. Kemper Foundation and Commerce Bancshares Foundation. The money will be used to equip a classroom in the School of Business and Entrepreneurship on the university’s St. Charles campus with distance learning technologies. 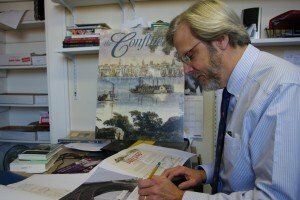 Jann Weitzel, Lindenwood’s Vice President for Academic Affairs, was recently notified that Jeff Smith, Chair of the History department, was selected for a 2011 Missouri Humanities Award for Lindenwood’s regional studies journal The Confluence, which Smith edits. Lindenwood University Press announces the release of a second, more comprehensive edition of St. Charles County Executive Steve Ehlmann’s acclaimed book, Crossroads: A History of St. Charles County. At nearly twice the length of the first edition, published in 2004, the new edition is more comprehensive and corresponds with the 2012 bicentennial of St. Charles County. Lindenwood University President James D. Evans is calling for support of a renewed state-wide campaign launched by the Independent Colleges and Universities of Missouri association to save Access Missouri funding. The state’s primary need-based college tuition assistance program was slashed by more than $50 million in 2010 and is in danger of being cut further by Missouri Governor Jay Nixon as he finalizes the budget for the coming fiscal year. Lindenwood University will host the Lewis and Clark Fife and Drum Corps Freezer Jam concert at 7 p.m. on Saturday, Feb. 18, 2012, in the Hyland Arena. The event will feature more than 10 corps from the Midwest who will perform historical American military music and gather together for a mass band finale.